This page is a history of my quest for the best playback system possible. I built a front-loaded horn system with a large infinite baffle behind two 15" low frequency drivers. I had saved my money to buy two Stromberg Carlson 15" drivers with bright red cones and fairly large voice coils. I was disappointed to discover that they had relatively high free-air resonances. I steamed some thin plywood boards and bent them into roughly an exponential curve as per plans I found in an early edition of Audio Magazine. 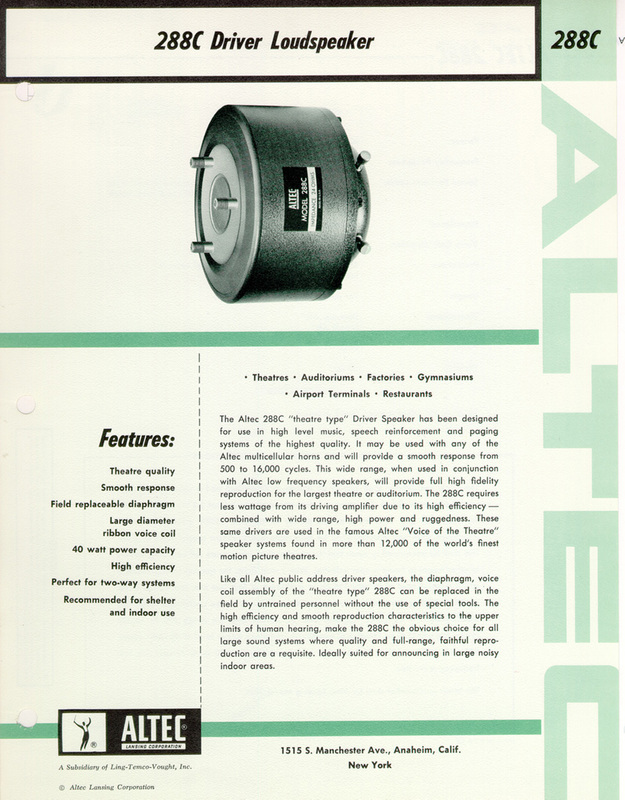 The high-frequency section was an Altec Lansing horn whose model was an 811B, and the driver was a 288C. I only had monophonic sound, but it certainly could achieve high sound pressure levels, at least above 50 Hz. While in college, I improved the front-loaded horn by doubling the volume in the infinite baffle, but this system still lacked the bass response I longed for. I also tried to build a system called "Ton-and-a-Quarter of Sound" from a design in Audio Magazine. This system used thin-wall concrete for both the bass and treble sections of exponential-sectoral horns. 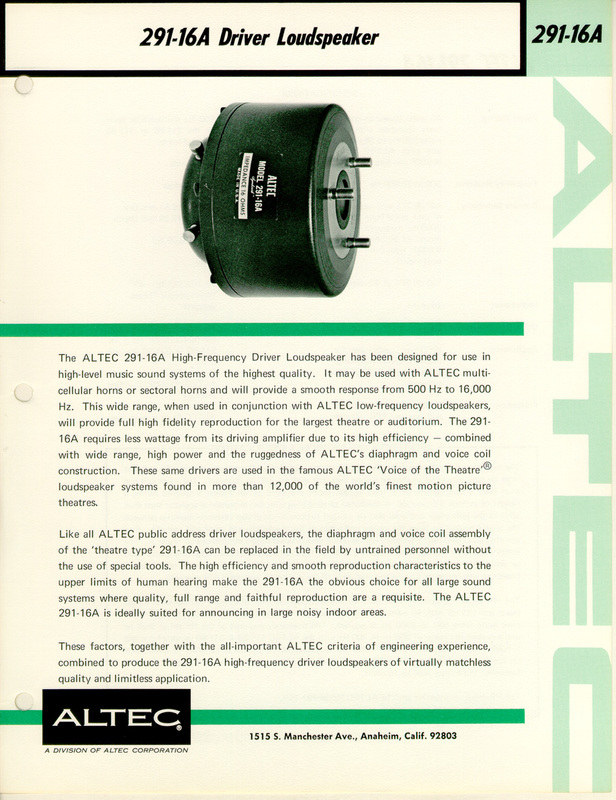 The high frequency unit used an Altec 288C as the driver and the bass horn used two Jensen 15" drivers. Despite significant help from the author, I never completed the moulds from which the enclosures themselves were to be cast. After having worked a couple years, I was able to purchase the Infinity IRS or Infinity Reference Standard. (Picture of left side) (Great web site for Infinity Systems) I was the proud owner of serial number 4. 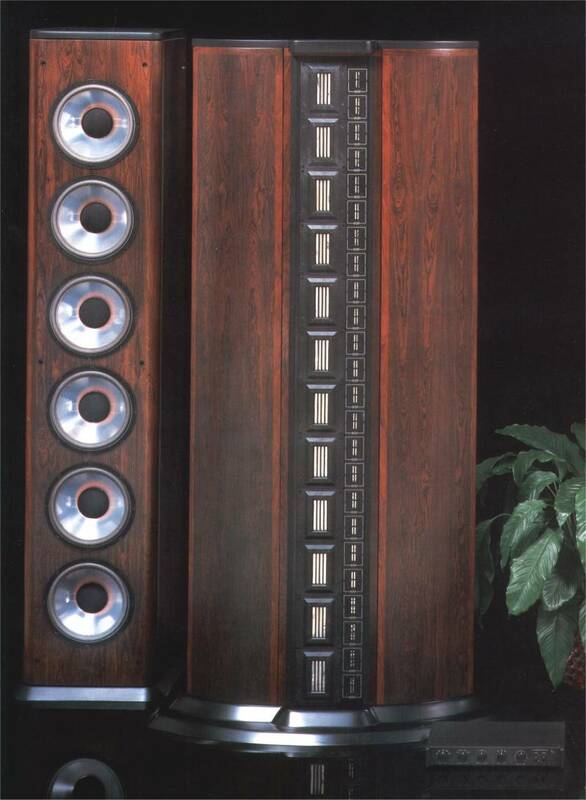 This was a beautiful Rosewood system with two towers containing six 12" woofers each, and two curved panels with electromagnetic flat panel drivers. There were, as I remember, 24 of them in a vertical linear array per side. The response above 40 Hz or so, was flat, and extended beyond my hearing range to something like 40 KHz they claimed. These physically beautiful speakers did not reproduce organ tones down in the low registers at adequate volume levels. The low frequency towers had built-in amplifiers and there was an accelerometer glued onto one woofer of each side. After a week of playing the system, I remember the start of many problems in their design, beginning with the left side's glued-on accelerometer falling off of the cone. Infinity supplied me with the schematics of the system, and I had numerous repairs and modifications to their electronics, most of which were in the accelerometer amplifier and integrator stages. I re-glued the accelerometer onto the voice coil dust cover and also touched-up the other side, which ended the physical problems. I paid $22K for this system and unloaded it for $14K a couple years later to some guy in Santa Monica who was thrilled to obtain it. Just the packing crates alone, all custom made and felt lined, were something to behold. 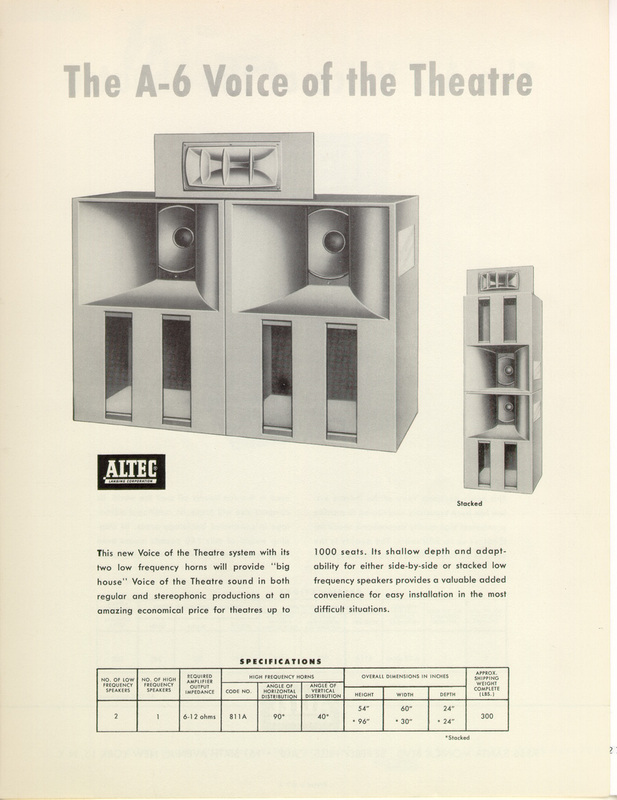 I was still enamored with horns and purchased an Altec Lansing theater system (similar to the A6 shown in the link, but twice as many drivers) with four very imposing plywood enclosures, and two large aluminum horn high frequency units. The low frequency units had four 15" drivers per side, front horn loaded with a bass reflex design for frequencies below 100 Hz or so. The high frequency horns were exponentials with 291-16A drivers. Everything was bi-amped. The SPLs were very impressive, the response was anything but flat, and I still had negligible response below 50Hz. I cross this sub-woofer system over at 62 Hz, and above that, is a pair of JBL 4675C-8LF theater loudspeaker systems. This is a really flat (specs), efficient, speaker system, THX qualified for use in theaters, and not really expensive. I just don't understand why they are not more popular with serious audiophiles. Sure they are large and imposing, especially the exponential-sectoral horn, but their response is so flat, they are hard to ignore. (For good prices on JBL professional equipment, look to this site) I cross the 15" drivers and the horn over at 500 Hz. All speakers are separately amplified and the electronic crossover is a JBL DSC-280 as mentioned. The 280 allows for time-alignment of the non-planer speaker cones to keep the response smooth. I highly recommend the DSC-280 as an electronic crossover. My high-frequency amplifier and my mid-frequency amplifier (left and right front) is a pair of Yamaha M-85s which I'm guessing are around 250 watts per channel each. Each set of Electro Voice 30W drivers (3 per set) is driven from one Adcom GFA-555. Each GFA-555 is a pair of 200 RMS Watt amplifiers. I use two additional GFA-555s for the front and rear surround amplifiers. I have no preamp. The output of the CD player which is a Yamaha CDX-5000, feeds the JBL DSC-280 directly, thus avoiding any superfluous electronics in the playback path. I set the volume by using the remote for the CD player. The DSC-280 takes care of all the Linkowitz-Riley phase and amplitude crossover responses, plus the shelf amplitudes of each band-limited channel. It also includes a limit function which I didn't used to invoke, but after feeling the front pane-glass window excursion on some playback material, I now have it set. With regard to flatness, from 62 Hz through 16 kHz, the JBL THX spec allows for a 3 dB variation. The listener must be within 20 degrees of on-axis to the horns to get the 16 kHz which I always am where I listen. From 12 Hz to 62 Hz, I have a 5 dB variation, probably due to the room's contribution to standing waves. The big advantage to this design over other "over-the-top" designs, is the sound pressure level (SPL) in the 16 to 64 Hz that this one can achieve. I have heard no other system reproduce the low C (16 2/3 Hz) to C (33 Hz) octave at such high SPLs. With heavy pipe organ music, I can not tell the difference between being in a large cathedral and being in my living room, which is why I went to all the trouble in the first place. I can play the volume realistically and truly duplicate the sound I hear live, or crank it up, and vibrate the pictures off the walls. There is the lead-in to the Telarc CD "Time Warp" (CD-80106) which includes a synthesizer producing the low notes from Richard Strauss' "Also Sprach Zarathustra", that at high SPLs scares me because the front pane-glass windows are moving about one-quarter inch at their centers. I realize at some excursion, they will sustain an expensive crack, so on this CD, Wellington's Victory, and any 1812 Overture CD, I pre-play the tracks to find a safe volume level. After all this expense and effort, am I happy? This system is my final system. I have had it untouched for going-on five years, and will die with it, although it may get transported to a new home when I move. I have added surround, and will recreate it when I move to my retirement home. I will make one modification to the design when I move, and that is to excite the room with the low frequency energy from the corners of the room. I now have the low frequency drivers on a flat surface (see pictures) and suffer from room standing waves. Exciting the corners and carefully picking the room dimensions will lessen this phenomenon. My planned playback system/home theater room is 42'W x 57'L x 30'H. FAQs- Via e-mail I have been asked several common questions. Here they are with answers. How much did this system cost? All combined - about $45,000. Some of the major items were the Electro Voice 30Ws at $658.00 each. They are hard to find at any price now. Each JBL 4675C-8LF was about $2500.00 (Good JBL professional prices) and I spent around $25,000 modifying my house, which included the 8" thick concrete, 640 cubic foot, low-frequency enclosure. I have perhaps $8000 in the electronics. It was based on my desired SPL at the lowest frequencies and the efficiency of the mid and hi-frequency drivers. The JBL 4675C-8LF system is fairly efficient as it was designed for theater sound reproduction. The 30Ws may be driven with only 75 Watts RMS and the cone excursion is something like 3/4 of an inch maximum. So, to match the higher frequency driver efficiencies, I chose six 30Ws driven with 500 RMS Watts. Another argument is from a cone area perspective. The Infinity IRS system used twelve, 12-inch drivers for a total cone area of 1357 square inches. My six 30 inch drivers have a cone area of 4241 square inches. After owning and being disappointed with the IRS, I thought a four-times increase in cone area wouldn't be excessive. Have my neighbors called the police complaining about the loud noise? I've been turned-in for four other complaints, but so far, not the stereo. Why again is there an accelerometer glued onto the low-frequency driver? There are two, one for the left front, and one for the right front. They provide negative feedback to correct for driver and enclosure non-linearities. The cone motion's velocity is proportional to the electrical signal feeding its voice coil. If somehow a very linear sensor could be coupled to the cone motion and subtracted from the known good signal feeding the voice coil, an error signal would be generated that would represent the non-linear distortion happening in the electrical-to-acoustical conversion. If you glue a low-mass accelerometer to the dust cover of a driver, amplify the sound and listen, it sounds very tinny. This is because the cone motion is proportional to the velocity of the electrical signal and not the acceleration. To process the accelerometer's output to match the velocity, simply integrate it once. The error signal is inverted and fed back into the amplifier driving the driver, or at least 20 dB or so, of it. As in an electrical servo, this feedback reduces the distortion, flattens the response, and reduces the gain of the system which is easily made up in voltage gain ahead of the servo amplifier. Unfortunately, I still have standing waves in my listening room, which this feedback system does not correct.